I've been hauling a lot this month, I still do please don't judge me, for some reason I want to try a lot of new things especially for my face make up and skincare. At this post I'm gonna show you half of the stuff I got a few weeks ago, and I'm gonna do another one next week about the newest stuff I got recently. I have to start with the big order I did from iHerb, I got lots of Real Techniques brushes for the face, mostly because my skin started to react to most of my brushes in my collection and since Real Techniques brushes are synthetic I thought that it would be a good opportunity to try most of them, this is something that I wanted to do for almost a year now. I got the Core collection, the powder brush, the blush brush, the stippling brush and the setting brush. I've tried all of them and I have to say that they're amazingly soft, my absolute favorite so far is the Blush brush, I use it for my bronzer because it has the perfect shape! Also I've been loving a lot the setting brush, which is really good for applying concealer under my eyes and around my nose, and also applying highlighter on my cheekbones. I really want to try and experiment with them more and see which are the ones that I love the most. 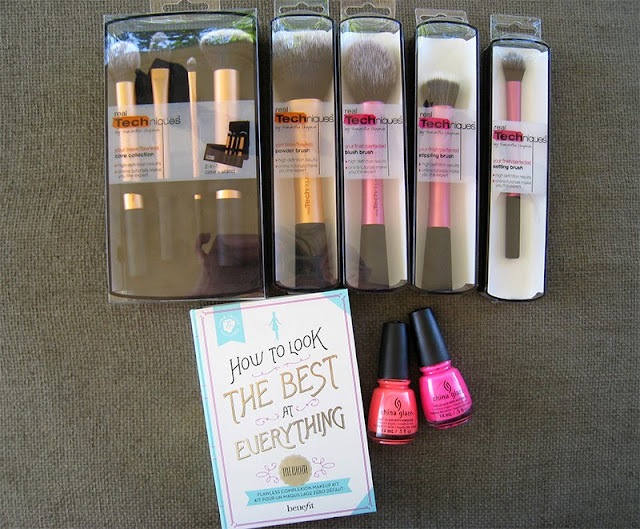 A few weeks ago Sephora I got this Benefit How To Look The Best At Everything make up kit with 40% off, which I think that was such an awesome discount. I got the kit in medium and it includes the famous Porefessional face primer, the Hello Flawless Oxygen WOW Brightening make up in Honey, two shades of the Boi-ing concealer in 02 and 03 and the Hello Flawless powder foundation in the shade Honey, all the products of course are in a mini size. I've been testing them out for a few weeks and besides the powder foundation which I already love and I've mentioned it countless times in my blog, Porefessional is the one product that I enjoyed using the most from this set, it's an a amazing primer and I want to test it out with the rest of my foundations too besides the Hello Flawless, and see how it performs. I'm still not sure if I like the Hello Flawless Oxygen liquid foundation, I love the shade it's the perfect match for my skintone (NC25), but it gets really oily after two hours and it transfers a lot, I'm not sure if this is happening because the weather here is being super hot and humid, but I really want to test it out on a colder weather too, maybe I'll like it more then. The Boi-ing concealer is really good, it reminds me a lot of the Mac Studio Finish concealer, a little less creamier though. The shade 03 is really similar to my Studio Finish in NW25, but Boi-ing performs way better as a face concealer, on blemishes and scars, it stays on longer. 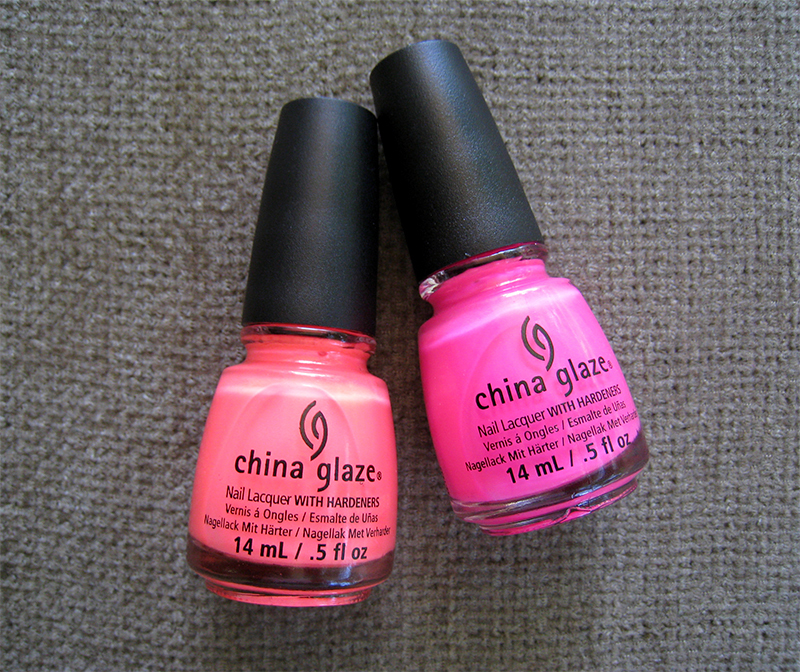 Lastly I got from Ebay two polsihes from the China Glaze Summer 2013 Sunsational collection, Shell-O (left) and You Drive Me Coconuts (right). I love neons for summertime, actually I only wear neons on my toes for the whole summer. These two are jellies, which are more sheer than the usual cream textured neons, but most of the times I end up hating cream neons because they create lots of streaks. Shell-O is a beautiful coral pink shade and Drive Me Coconuts is a bright pink with purple undertones. Actually Drive Me Coconuts is the one that I love the most and that surprised me because I'm more of a coral person, but the texture is way beter than Shell-O's, is not as sheer, and the purple undertones matches really good with my skintone. I hope you liked my haul post, there are more to come in a new post! Until then tell me, have you tried any of these products? Do you like them? Oh and one more thing, if you want to make an order from iHerb for Real Techniques brushes and more, you can use this gift code, TDZ975, and you will receive $10 off your first order of $40 or more, or you can take $5 off if your order is less than $40. I love my RT brushes and I've been wanting to try some China Glaze polishes for so long now - those colours are gorgeous for summer. Chian Glaze's neons are my favorite thing, I can't wait every summer to see their new neon collection! Of course, thanks :) Tο setting brush ειναι παρα πολυ καλο, να το παρεις!! Y-Π-Ε-Ρ-Ο-Χ-Α.! Να τα χαίρεσαι όλα.! Αυτά τα πινέλα μου έχουν κινήσει την περιέργεια..
Σ'ευχαριστω πολυ!! Και εγω το καθυστερουσα να τα παρω γιατι εχω πολλα πινελα στη συλλογη μου, αλλα αξιζουν!! I absolutely love the real techniques brushes! You have to try the eye set as well! The deluxe crease brush is phenomenal. OMG there are so many brushes, I know I need to try them all out. I decided to try first the face brushes, but the eye set is definitely in my wishlist! Great haul! I need to try more of the real techniques brushes I only have one. Με γεια σου, με γεια σου!!! Έχω το Core collection & το σετ για τα μάτια, όπως κ το expert face brush. I absolutely positively wanna by the stippling brush as well as the blush brush! Loved the nail polishes, though I'm not really a neon person; I'd go for a pedi too! 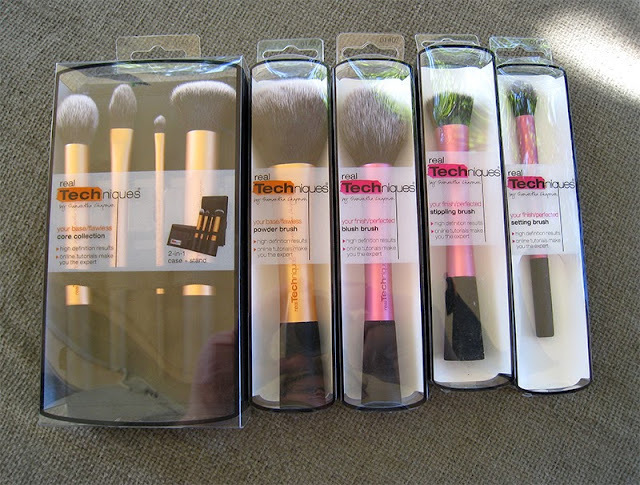 Ohhhh you have to try the blush brush, it's amazing! If I could live with only one brush for my blushes, bronzers and powders that would be the one! Σ'ευχαριστω! Ναι ειναι μικρουλι σετακι, κ μπορεις να ταξιδεψεις με αυτο ανετα, κ ετσι να εχειw οτι χρειαζεσαι για το face make up. prin ligo kairo pira t prwta china glaze kai t exw agapisi.8elw n parw oles tis neon apoxrwseis twra g t kalokairi!oso g t real techniques p exoun aresei poli i core colection kai to setting brush.otan t xrisimopoiiseis perimenoume n mas peis tis endipwseis s! exw ki egw ta core collection k thelw na agorasw k to powder brush!!! Απ'οτι διαβασα ολα τα jelly ειναι πολυ sheer εκτος απο το Drive Me Coconuts γι'αυτο κκ το διαλεξα, κ πραγματι με 2 στρωσεις ειναι ΟΚ. τι υπεροχα πραγματακια! δυσκολο να βρεις καλα πινελα!